Leading expert in security for high-rise buildings and corporate/manufacturing facilities, David G. Aggleton, CPP, CSC is recognized for exceptional achievements in the security consulting profession. The inaugural U.S. Outstanding Security Performance Awards (OSPAs) held September 14, 2016 in Orlando, Florida during the ASIS International's 62nd Annual Seminar honored the outstanding work being carried out by the U.S. security industry. Security professionals from across the U.S. came together to discover the winners of the OSPAs and celebrate their achievements. A panel of highly respected industry judges made awards in nine distinct award categories and for the “Outstanding Security Consultant” category of the competition, David G. Aggleton, CPP CSC was selected to receive the award. "Our finalists and winners are true representatives of outstanding practice in the security industry,” said Professor Martin Gill, founder of the OSPAs. “The security industry needs to celebrate these achievements and show the world the valuable work that is done, and the OSPAs — building on success in other countries — is emerging as a high profile part of that process,” he said. Harold Gillens, PSP, CFC, CHS-III, President of the International Association of Professional Security Consultants (IAPSC) said: “As a leading expert in security for high-rise buildings and corporate/manufacturing facilities, Aggleton’s consulting services and innovative solutions have helped improve and sustain the security operations for a large number of major corporations and national landmarks, including the iconic Empire State Building.” “He is a highly regarded security consultant and most deserving of this prestigious award,” said Gillens. "I was honored to have been nominated by the IAPSC and overjoyed to receive the inaugural U.S. OSPA,” said Aggleton upon receiving the award. “Dr. Martin Gill is to be commended for his innovative program to launch the OSPAs internationally,” he said. Aggleton joined the IAPSC as a member in 1991, and in 2011, he was certified by the IAPSC as a Certified Security Consultant (CSC). He has been a member of IAPSC’s Board of Directors since 1996, serving as its President 2003-2005. 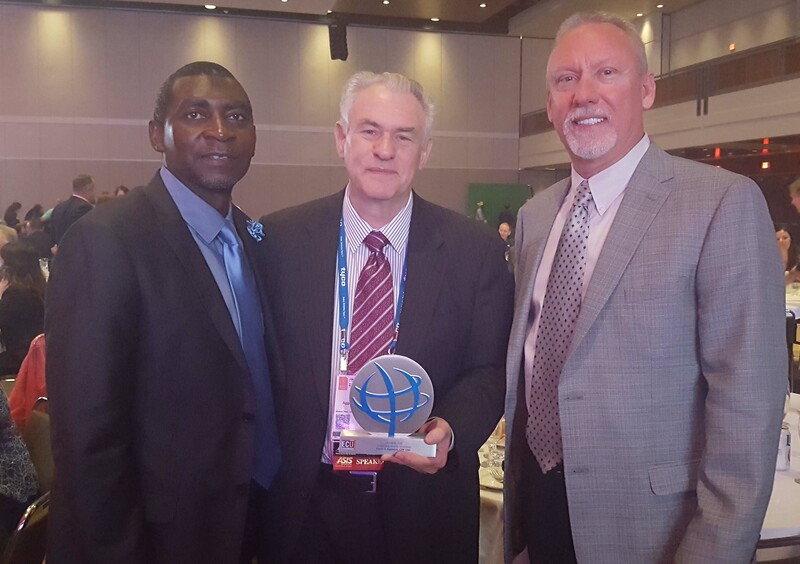 OSPA award winner David Aggleton (center) with IAPSC President Harold Gillens (left) and IAPSC member and OSPA finalist Pete Van Beek at the 2016 U.S. awards ceremony in Orlando.